The cover is simple but does not give a clue about the content. Rev Dr June Harris (known as Pastor June) was the first female and youngest pastor ever appointed to St. Mark Church. This was six years before we first meet her and, although she had met with much hostility to start with, she had become a respected and popular leader of her predominately black church which had grown from 100 to 350 members while she had been there. She had a "bachelor's degree in religion, a Master's degree in divinity and a PhD in practical theology". Previously she had been a highly regarded detective on the police force in Sarasota, Florida, where she had got engaged to her police partner, Detective Mario Grimes, but his parents had been much opposed to her (they had discovered that her parents had been "a black prostitute and a white John" and that she had been brought up by a doubtful character known as Mama May, although in fact Mama May had been a really good woman who had devoted much love and care to June and been much loved by her. They also said that June wasn't black enough! The truth was they had other plans for their son.) The result was that he had left her waiting at the altar and married someone else without so much as a phone call. He had been her only lover. She had always been a religious person, and came to realise that God was calling her into ministry, but "she always continued to detect wherever she went". She is only 4ft 11in tall, wears glasses and can be " blunt and brash", but she has a "knack for reading people's natures". A native Floridian, "she spoke with a thick southern drawl". She emerges as a real person, complete with human faults and failings, with a sincere if simplistic faith. Rev Lee M Sapp (1967- ) was born in Sarasota. She says she felt God's call in October 2005, and was first licensed to preach at St. Paul AME (African Methodist Episcopal) Church, West Palm Beach. She was ordained in 2012. She has a Bachelor's Degree in Religion, graduating from Payne Theological Seminary in May 2014 with a Master's Degree in Divinity. She is currently an Associate Minister at both Grant Chapel AME Church in Lake Worth, Florida and St. Paul AME Church in West Palm Beach, Florida. 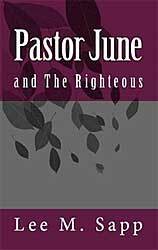 Pastor June and the Righteous (reviewed below) was her first novel, although she has written short stories, plays, poems, litanies and prayers, and sees writing as "another mighty way in which God uses me for ministry." She and husband live in Loxahatchee, Florida (near West Palm Beach) where they have been happily married for over 24 years. An adoptive mother of six, she has been a very active adoption and children's rights advocate for the last ten years. She is also a certified Christian Counselor. She self-publishes her books under the imprint of Nirvah Books. Pastor June and the Righteous is described as "Christian Fiction for Grown Folk" and amongst those whom the author thanks for their "support, encouragement, and contribution to this work" is "the Lord God Almighty". When Cecily Reardon is found murdered in a field, the evidence leads Veteran Detective Mario Grimes to St. Mark Church and back to his one true love, Pastor June Harris, formerly a very talented police detective, who had left the force to pursue her call in the ministry. Her arrival at St. Mark was met with much opposition from the congregation but now six years later these same people are her biggest supporters. They became her only family and she was happier than she had been for a long time. However, when Detective Grimes, the only man she had ever allowed herself to love, appeared at St. Mark, seeking her help to solve the murder of her former church member, it forced her to reflect on the darkest time of her life when he had abandoned her and crushed her heart. He tells her he would like to get back with her but she tells him in no uncertain terms, "Any relationship that I have has to be with someone who is equally yoked with me. That means, an active, card-carrying, saved, sanctified, Holy Ghost filled Christian." "June, please tell me what I have to do." "There isn't anything you can do. Salvation happens to us. Christ knocks on the door of your heart and you choose to let him in. Until that happens, you can join all the churches in the world, but that's not what makes you saved, church membership is just the beginning of an opportunity to seek the Lord's face but until you allow him into your heart, mind, and soul, you are not saved." So Mario ends up by taking instruction and being saved - but she had prayed about it and tells him that she had "heard from God and he showed me that you were not the man who He desires for me." Fortunately the Reverend Brice Howard (whom she had known in seminary) turns up. "He was tall and dark with the biggest hazel green eyes that were encased by a million eye lashes." After just their first date he reminds her, "The reality is I live two and a half hours away. And I need to know if you are interested in pursuing a relationship with me or not." June looks up at him and tells him. "I know that God is speaking to my heart about you. I believe that the possibility of 'us' is worth pursuing." It all sounds distinctly stilted, particularly when he explains, "It was God's favour and my obedience to His divine guidance that got me promoted so fast" (he had just been made Supervising Elder of her district). But she decides she is ready to "submit" to him even though he has arranged a whirlwind marriage "without her knowledge much less her consent". For she knew that he was "the man that God intended just for her." There are more long prayers before Pastor June could "smile as she finally knew what it felt like to have joy coming from her soul, pouring from the inside out." Some of the characters are quite interesting, including the medical examiner whom everybody called Cowboy Joe because "he wore cowboy boots, a big cowboy hat, and the whole nine yards" and was respected by everybody "not because he was so huge, but because his compassion demanded it". He was a white man, married to a Seminole Indian and with a black daughter-in-law. As Detective Grimes could not help thinking, "Got the cowboy, the Indian, black kids, all that's missing is the construction worker and the YMCA song". Then there was Myrtle Caldwell, Pastor June's self appointed personal assistant, who "was compelled to constantly remind Pastor June about her schedule, what the newest issues in the church were, and what she felt Pastor June should do about each issue." Pastor June felt that she talked ad nauseam, but then she remembered her kindness and how she had "some sort of healthy breakfast food" waiting for June's arrival at church every morning. She seems a real person. The church background is presented throughout in a very convincing way, as when June comments on how having a parsonage could be a mixed blessing: "When you lived in the parsonage, people had a tendency to drop by for all kinds of reasons, very few of which actually required any pastoral care. Mostly, people would come and 'donate' to the parsonage their old furniture if they were getting new furniture and were offended when the offers were declined." So she was delighted when the parsonage was converted and expanded into a commercial cafe that they called the Sunday Morning Cafe that "supported practically every outreach ministry that St Mark had." There is some amusing dialogue too as when the self-important Pastor Brown is interviewed by the police: "He took his seat in the enormous chair behind his enormous but beautiful mahogany wood desk. 'So, I'm sorry, I don't remember your name' he said to Detective Wright. 'I'm Detective Sylvia Wright, Mr. Brown.' she said. 'I'm accustomed to being referred to as Reverend or Pastor Brown, Sylvia.' he said. 'I'm accustomed to being referred to as Detective Wright." She responded rather more sharply than she intended. Pastor June hung her head down and smiled to herself then spoke to break the tension. 'I'm usually referred to as the Rev Dr. June Harris." she said with barely a straight face, she couldn't help herself then she and Detective Wright smiled at each other." It seems a real-life situation, even if, as so often happens with self- published books, the punctuation leaves something to be desired. June herself is not always an entirely attractive character, and there are times, as when she gets really angry with Reverend Brown for not dealing more firmly with the bad behaviour of his choir director, that she sounds distinctly self-righteous. It seems ironic that a different Biblical text about righteousness is used at the start of every chapter. Later on she makes a vigorous, if justified, attack on an aggressive minister from another church who tells her, "I came to ask how you qualify calling yourself a pastor when the Bible clearly says that women are not supposed to be over men." She tells him that "I'm going to give you a theology lesson .... If you're going to minister, if you're going to teach God's word to God's people, you simply need to know more about who God is." Just as she does? But she offers him "a scholarship to our Minister's Training School" where he can learn better. The murderer, who turns out to be a religious fanatic, is at first just called "he" in a rather clumsy sort of way. This is one of the places where an experienced editor might have helped the author to build up some suspense. As it is, too many irrelevancies are included, as when we are given every word of June's long prayers, and the story isn't really strong enough to hold the interest throughout. It would benefit from pruning. Pastor June and the Coveters describes how Pastor June's life is interrupted once again when Detective Grimes, her ex fiance and ex police partner, receives a ransom call about the kidnapping of his daughters. His youngest daughter, Cady was last seen with Jackson Bonnen III, the son of a wealthy accounting firm owner in South Beach, and Cady's close friend, a social misfit nicknamed Two Touch. Both of these young men were desperately in need of money and they also happened to be two of very few people who knew about the wealth of Detective Grimes' family. Pastor June anxiously attempts to juggle her role as pastor of the newly expanded St. Mark Church and being a new wife and foster mother to orphaned 7 year old Rosie - and she is pregnant, which is why her husband, Supervising Elder Brice Howard, strongly opposes her involvement with any sort of detective work. This leads her into some bitter rows with him. He tells her, "I'm still very angry with you, June. I know by now you're going to do what you want to do no matter what I say or how I feel but I will go along with you on this only because I don't trust you to take care of you." June "got upset again because she felt he was trying to make her feel guilty. She raised her voice slightly, and said, 'I don't know how much this is an adjustment for you but it's a huge adjustment for me. I'm not accustomed to having to tell somebody where I'm going and what I'm doing'." And you can understand why she feels that "Every price being paid for their marriage, every sacrifice was being billed to her." Her church secretary Myrtle was well aware that, "People just couldn't get past what many deemed a conflict of interest with Brice being in official authority over June in the capacity of ministry. Many of these people had already been victimized by June's wrath and could not see her being changed by anyone." All this makes her seem all the more human. And she admits to getting really angry when one of her associate ministers attempts to "steal" her members and June has to put her firmly in her place. As in the previous book, the author's strength lies in her description of the beliefs and practices of her own church and she brings these alive with sympathy and understanding. Her description, for example, of June's altercation with Sister Barclay about the function of the Steward's Aid Board leading up to June telling her,"Get out. I refuse to spend another scintilla of a second on this topic with you" may be very parochial but it rings absolutely true to life and you are left wondering if the author could be remembering one of her own experiences. It ends with the angry June telling her, "Every time you open your big mouth with some new ignorant statement it reminds me why I'm here and what called God called me to do." But June knew that "she should have felt bad and that she had crossed a line" and admits to Myrtle, "I'm gonna have to apologize ... I'm going to pray about it. I had no idea my (hormonal) emotions would get this loopy this soon." "To tell you the truth, Pastor, you were always close to loopy anyway," Myrtle said with a giggle. "Thanks a lot, Myrtle." This sort of gentle humor really helps the story along. It is interesting too how the pre-marital counseling that she conducts includes the couple's compulsory "full disclosure" to each other not just of their respective bank statements but of the results of specially taken HIV tests. Then it's time for "praising God from way down deep. June called it deep belly praise." There's a lot of prayer and praise in this book and the author finds it difficult to restrain herself when it comes to telling us each word not only of some prayers (no matter how long) but also of her sermon, ending with her exhortation, "I don't know about y'all, but I'm praising God this morning .... Oh you better know I'm gonna praise Him! Is there anybody else here this morning that just has to praise Him? Is there anybody here who's gonna help me Praise Him?" There was. And several people were "slain in the spirit as Pastor June and the other ministers laid hands on them." What are much less convincing are the more melodramatic elements of the plot. And the dialogue is often rather clumsy, as in some of the above quotes and when her husband reassures her, "I know you're concerned about all the warnings and testing we've had to endure because of your age with this pregnancy but I believe God will give us favor like He always has." Once again the author might have benefitted from the guiding hand of an experienced editor, who might also have persuaded her to carry out some significant pruning, as when every chapter is headed by a Biblical quote in which the word covet is included. These do not really help the story along as their relevance is not immediately obvious. It might have been better too if she could have concentrated more on relationships and rivalries within the church that she knows so well rather than on the more conventional external baddies. There is interesting detective work to be done without always having to involve unlikely kidnappers or murderers.